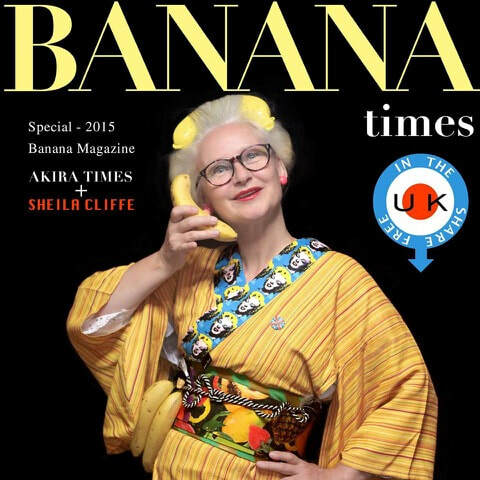 Sheila Cliffe is a professor at Jumonji Women’s University, and has been in Japan for over 30 years, the vast majority of them in a kimono. After gaining a reputation as “the kimono lady”, and being presented on TV and in magazines as some sort of kimono expert, she decided to get a Ph.D. and become a bit more academic in her area. In 2017 she published The Social Life of Kimono with Bloomsbury Academic. Her research centres around the kimono as a garment with a fashion history, and as an embedded fashion item. She considers herself to be not only a kimono trend hunter, but also a myth buster. She continues to research contemporary kimono, and to put her work online, in order to counteract the orientalization surrounding the kimono that continues to spread myths and false information outside Japan. Sheila enjoys fashion, textiles, gardening, music and her crazy family! I felt a little bit of a fake being called a kimono expert, without having an academic background. I was a qualified kimono dresser and teacher, but not an expert. As I have always wanted to write a book, (and had been turned down several times over the years), I thought that perhaps doing a Ph.D. would be the ticket that got me to the place where I could finally make a book proposal that would be accepted. ​It was really hard being a single mother of three, working full-time in Japan and going back to the UK twice a year for four years to complete the work and, as an overseas student, it was incredibly expensive. However, it worked, and I ended up publishing with my first choice of publishers. (If you consider a career as what I do at work though, getting this qualification made no difference at all). I feel that there is still so much misinformation about the kimono on the web. Just search for "kimono" on Getty Images and try and find a young woman wearing an everyday kimono. You can’t. So I wanted to answer the question, “What do real Japanese women have in their kimono closets?” I am half-way through the process of emptying 50 kimono closets of women in five age groups to find out what they have, where it came from, and how it is all stored. This is the real story of kimono in the lives of Japanese women today. It is a myth-busting exercise, and it is important that this information is available for the next generation. It is a part of a new field called "wardrobe studies", which is basically clothing end user research. There has been no end user research on kimono yet, as far as I know. It is very hard to pick one. I can pick two though. Daniel Miller’s works on material culture, which are basically ethnographic studies, have had a big influence. I was especially impressed with “Stuff”. Miller went into lots of homes on one London street and people talked about their relationships with all the stuff in their houses. It made me realise that stuff is not just stuff, but the carrier of histories and stories. I found it very significant and moving. ​I am also influenced by the anthropologist Kon Wajiro. He stood on street corners in Ginza and Shinbashi, to record what people were wearing. He did it many times and made studies of footwear, hairstyles, aprons, kimono types. He left hard data that show when Japanese really began to change from kimono to western dress, and it is much much later than is written in most of the histories. He is a model for me, and I am trying to continue his work. Humanities seek to explain the human in science. There is so much about us that cannot be explained by hard science: Why we make societies and cultures and groups, why we make things, decorate things and give things meanings, why we have emotional attachments to them. Doing all these things is what makes us human. Fashion research generally is expanding and is becoming more about the user rather than the economy of the fashion system or the famous fashion designers. It is also at a paradigm shift, where it is finally (and belatedly) learning to recognise fashion systems outside the west. Situating kimono in that body of research is not easy, but I am creating the end user research. Kimono is also undergoing a paradigm shift which I call a "re-democratization" of the garment, which is actually a move back towards being normal clothing.